Approaching winter and a season of holiday celebrations means gifts, decorations, and gatherings with friends. It is also an opportune time for reflecting on what matters most to us as we take leave from routine and make space for as much hibernation as our modern lives will allow. I use this time to make handcrafted gifts for those closest to me and I also look to winter herbs that I can incorporate into my seas onal ceremonies and rituals. One of the rituals I anticipate most eagerly is making a medicine wreath on the Winter Solstice. Collecting the plants for the wreath is a process that I undertake with awareness and appreciation. I walk through my garden of mostly dormant plants and I hear the winter whispers: the roots spreading and mingling underground, seeds laying in wait for warmer days, and the stillness of the latest frost that has settled over the land. I give thanks for these plants and the goodness that they bring into my life and I also allow myself to let go of what I have lost during the year. Sometimes this may be a wonderful experience to say good-bye to an unpleasant job or to see your child grow out of diapers. Other times the ceremony may take on more profound meaning as we process more difficult losses such as having a family member or pet pass on. Winter is a natural time of acknowledging the cycle of life; a time of recognizing all things coming into and out of being. It provides an occasion for honoring what has been; what is gone. Gathering the medicine wreath herbs is a process that embraces this connection between the past and the present as I take last season’s dry flower heads and dormant leaves and combine them with the pungent evergreen still full of vitality. It is a ritual that centers on acceptance of change, slowing down, and living life with deliberation and awareness. The plants chosen for the wreath are offered by my medicine garden. Last year’s wreath was made of sprigs of Juniper and Rosemary, Oregon Grape and Strawberry leaves, Horehound, Echinacea seed heads, and some Snowberries and Salmonberries. I select for color, aroma, and texture as well as for a plant’s healing properties. Juniper and Rosemary provide a rich evergreen background along with enduring aromas and antiseptic properties. Oregon Grape is a staple herb in my practice, treasured both as an evergreen garden plant and a multi-use medicine that provides tonification of the mucous membranes and protection against a multitude of microbes. Strawberry leaves’ red tone brings color to an otherwise drab-looking winter garden and calms upset stomachs and improves digestion as a tea herb. Horehound looks after respiratory health during cold and flu season and provides more healing aromatherapy as we come and go from our home. The highly esteemed Echinacea seed heads honor the universal healing process that they promote in our bodies. All these herbs are brought together to safeguard the health and wellbeing of everyone who passes through our front door. My family made this wreath last year. Underneath everything is an old wire hanger shaped into a circle. We used some fine hemp cord to attach all the Juniper and Rosemary to the hanger and then added the rest of the plants by tucking their stems into the evergreens. We discussed the ancient ancestral roots of our wreath-making ceremony and wondered what Roman families put in their wreaths over two thousand years ago as they honored the return of the light and the greenery it would bring. 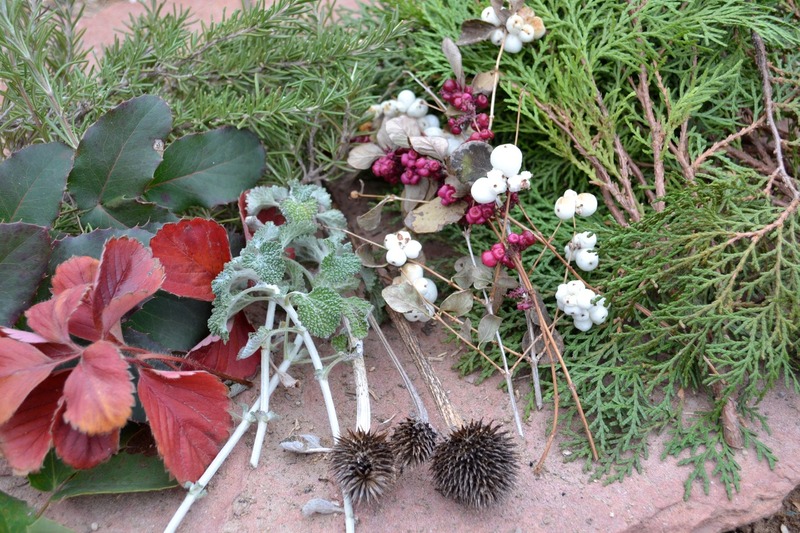 During our winter wreath-making ritual we see that we are the continuum of what has been. We know that nothing is ever truly lost. This entry was posted in crafts, gardening, herbal medicine, herbalism, herbs, holiday, solstice and tagged ceremony, herbs, holiday decorations, medicine wreath, winter solstice, wreath on December 6, 2014 by darasaville.